Home to two World Heritage-listed natural wonders and boasting a unique environment where Australia's largest rainforest, the Daintree Rainforest meets the Great Barrier Reef, Cairns and Port Douglas are natural hotspots for tropical experiences and nature-based adventure. There’s enough reef, sun, and wildlife to keep you occupied for a lifetime. African style safari tents, walking trails, canoes, ecocruises, wildlife safaris and privately guided nature experiences are found at Jabiru Safari Lodge, less than an hour and a half from Cairns and Port Douglas. 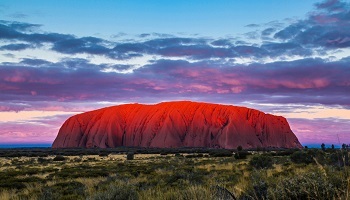 Experience the delights of the Australian Outback. 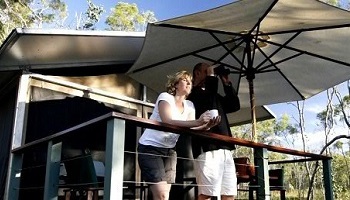 Enjoy Wildlife safaris with expert guides sighting kangaroos, wallabies, emus and abundant birdlife. Canoe, bushwalk or birdwatch at your own pace or with an expert guide. Go to sleep to the distinctive call of the curlew after stargazing under the magnificent southern sky. Wake to a dawn chorus alive with the sounds of the Blue-winged Kookaburra and Brolga. 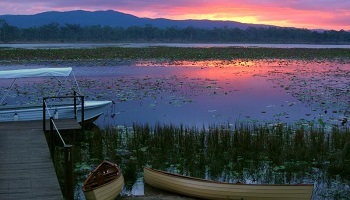 These and other delights of nature await you at Jabiru Safari Lodge in the Mareeba Wetlands. After a unique Outback experience at Jabiru, head east and take in the leisurely pace of Port Douglas, where the Rainforest meets the Reef. 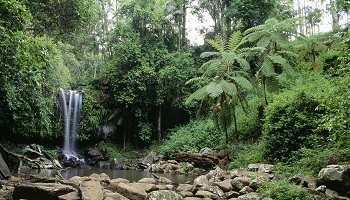 Enjoy a unique Aboriginal Dreamtime Walk in the Daintree Rainforest. 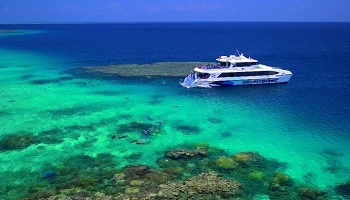 Take the plunge and learn to dive on the Great Barrier Reef. 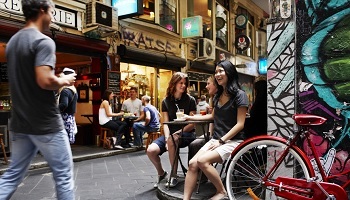 Take a stroll down Macrossan Street, lined with boutique shops and restaurants. Or perhaps just take time to relax and rejuvenate on the popular Four Mile Beach. 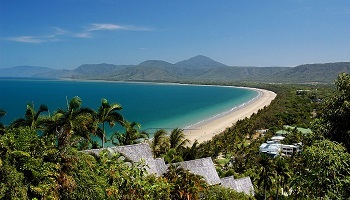 Upon arrival collect your rental car and self drive to Cairns accommodation. 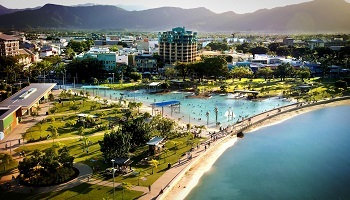 ACCOMMODATION - Shangri-La Cairns is superbly positioned within the cosmopolitan Pier shopping complex, overlooking the Marlin Marina and the Coral Sea; adjacent to Trinity Bay Esplanade the hotel serves as a gateway to the Great Barrier Reef. Designed with the surrounding tropical elements in mind, materials throughout the hotel are inspired by the rainforest and reef – interior finishes of granite, sea-toned walls, bubble-like light fittings, natural timbers and marine ply provide links to the natural world. Opening up the hotel, an extension of the external boardwalk and construction of a new awning around the entire building has been added. The Pier shopping centre and external faade has also been reconfigured with direct access to the hotel. 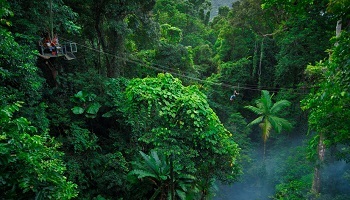 board the Skyrail Rainforest Cableway and glide above the rainforest canopy to Kuranda with stops along the way at Red Peak Station and Barron Falls Station. 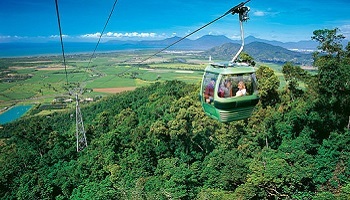 On arrival there is free time to explore the Village in the Rainforest, and its many attractions, including the Heritage Markets which operates daily, the Australian Butterfly Sanctuary or Kuranda Koala Gardens (own expense). Enjoy lunch at one of the many cafes (own expense). 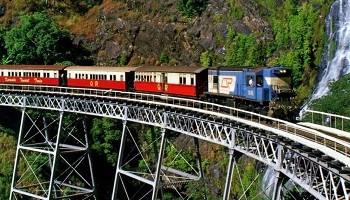 At 3.30pm board the Kuranda Scenic Railway to Cairns, and enjoy spectacular views as the train travels through 15 hand cut tunnels and past spectacular waterfalls. Stop at Barron Gorge to view the falls before arriving at Freshwater Station. Jabiru Safari Lodge is located within the Mareeba Tropical Savanna and Wetland Reserve, an hour and 15 minutes drive west of Cairns, on the northern edge of the Atherton Tablelands (Cairns Highlands). The 2000ha reserve of open savanna woodland, grassland, and freshwater wetlands provides a unique Outback setting for the Jabiru Safari Lodge, allowing guests to fully appreciate the outback savanna environment and prolific birdlife during the best times of the day. ACCOMMODATION - Stay 2 unforgettable nights in one of only three deluxe ensuite African-style tented safari cabins. Each safari cabin is appointed with comfortable beds and linen with natural materials such as timber floors to compliment the warm tones of the safari cabin furniture. The safari cabins are spacious and light with shaded private timber deck with BBQs and comfortable tables and chairs, perfect for bird watching, reading and enjoying the sights, sounds and scents of the Australian tropical savanna. Enjoy a glass of champagne as the sun sets over Clancy's Lagoon. "Outback with a touch of class!". 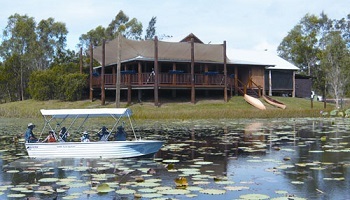 Delightfully sited on Clancy's Lagoon, the Interpretive Centre is the hub for all tours and activities. 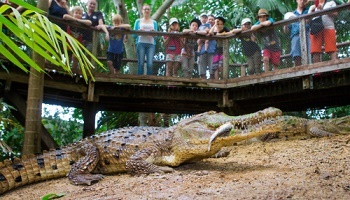 The Mareeba Tropical Savanna and Wetland Reserve is a unique community conservation project combining valuable conservation work with environmental education and sustainable, nature based tourism. Enjoy the daily wildlife safari, canoeing on Clancy's Lagoon, self-guided walks and membership of the Wildlife Conservancy of Tropical Queensland. Allow time to experience both the morning and sunset wildlife safaris and the full range of activities available. Travel aboard Quicksilver's 45.5 metre high speed wavepiercing catamaran in air-conditioned comfort to a spacious reef activity platform moored in protective lagoons at the renowned Agincourt Reef, on the edge of the Great Barrier Reef. Quicksilver has facilities to enable both swimmers and non-swimmers to experience this stunning reef world. Explore the reef from the comfort of a semi-submersible, the underwater observatory or by snorkelling. A range of optional activities are available including up to two dives for certified divers, and novices can experience the magic of scuba with a qualified dive instructor or an Oceanwalker helmet dive. Also available are guided snorkelling tours with a marine biologist and scenic helicopter flights over the reef (all optional activities at own expense). You are welcomed with a traditional 'smoking' ceremony that cleanses and wards off bad spirits. The walk then meanders through stunning rainforest and takes in traditional huts or humpies. 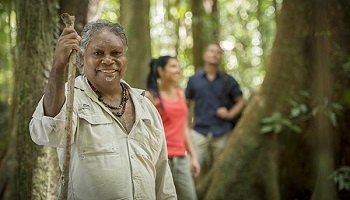 Your experienced interpretive Indigenous guide demonstrates traditional plant use, identifies bush food sources and provides an enchanting narrative of the rainforest and their special relationship with this unique tropical environment. A stop at 'the beach' where your guide demonstrates traditions like making bush soaps and ochre painting. 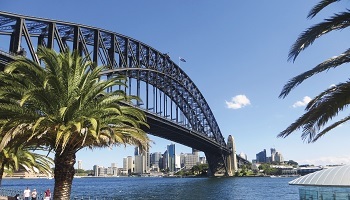 At the end of the tour enjoy traditional bush tea and damper. From pricing is valid for travel by 31 March 2019 (blackout dates apply). Prices are per person based on family of four occupancy departures from Los Angeles. Add-on fares are available from other cities. Certain black out dates apply on the accommodation and tour value add offers - check with your Aspire consultant. Seats are limited and may not be available on every flight. Please contact us for child airfare possibilities if under 12 years of age. Hotels are subject to availability. All prices reflect a discount for purchases made by cash/wire transfer/check, please see terms and conditions for credit card payments. There are no discounts for payment made by credit cards. Cancellation penalties and other restrictions apply.